Even the most experienced of us find the simplest aspects of life a strange affair, so, combined with the number of us humans rushing around from place to place, navigating our way through this tumultuous landscape could easily appear impossible to someone looking in from the outside. Just take the number of shops down your local high street, every single one of them has a purpose and it’s a function we’ve learned over time e.g. you know to buy your eggs from one shop and your electric drill from another shop. However, we’re certainly not born with this knowledge and, with our minds as blank canvasses, we have to gradually piece together how the fabric of the world is woven together, otherwise we’ll try and drill holes with eggs. For an alien visitor, matters are more complex. There’s no prior experience to draw upon, so the habits, cultures and emotions of Earth’s inhabitants must result in an exponential sense of bewilderment – just imagine trying to explain the phenomena whereby a sock always goes missing in the wash. In fact, a popular exercise set by school teachers is for their pupils to describe an activity in extreme detail for an alien who has descended from the skies. Whilst this is restricted purely to the imagination, occasionally an alien does come down to Earth and their curiosity is more than eager to Get Up and Go! Leaving his home planet of the moon and descending down through the Earth’s atmosphere, Mooncat (operated and voiced by David Claridge) has arrived on Earth to find out more about its inhabitants. 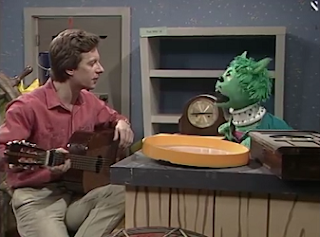 Being a newcomer to the planet and its curious ways, Mooncat can’t exactly live on his own, so he sets up home with Beryl (Beryl Reid) and Stephen (Stephen Boxer) who help to guide and entertain him with stories and music. Mooncat has also brought along some of his moon technology, namely the Moon Machine which allows him to peer through either a circle, square or triangle window to monitor those who dwell and toil on Earth. Oh, and he can teleport too. Looking through the colourful windows of the Moon Machine, Mooncat finds himself examining the life of a window cleaner, investigating where the milkman gets his milk from (to ensure that Mooncat can enjoy his beloved Cornflakes), watching a father and daughter take a trip to the library to borrow some books and even delving into horticultural matters by checking out time lapsed footage of mushrooms and plants growing. 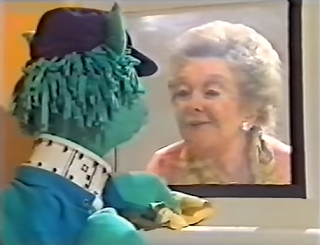 Mooncat doesn’t want to limit himself to being a mere observer, though, so he’s soon cleaning windows with Beryl or trying to grow plants by planting dolly mixtures. Helping to back up these dissections of life on Earth, Beryl and Stephen read stories to Mooncat which centre on the adventures of the little girl Billie and her animal friends Woodley the dog, Monkey, Mrs Pinkerton-Trunks the elephant and Mr Milford Haven the lion. 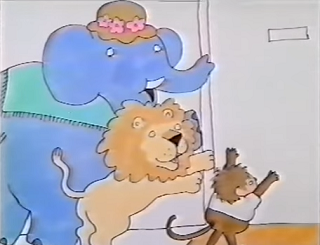 Reinforcing the episodes’ themes, these short stories see Billie and the animals panicking about the arrival of a man with a ladder (or ‘a lamb with a madder’ as Monkey mispronounces) who’s actually just a window cleaner and an even more simpler setup where Billie and the gang grow some plants (one of which is named Dorothy Perkins). 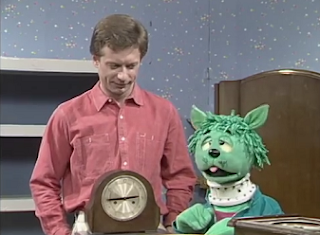 Eventually, Stephen moves out of the shared house and goes to work at a local playgroup, but he still manages to find time to visit Beryl and Mooncat every week. 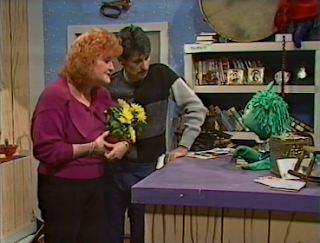 Life with Beryl can’t go on forever and, fulfilling one of his lifelong dreams, Stephen opens a second-hand shop along with Mooncat in Mooncat & Co. Helped by a never ending stream of customers such as Pat Coombes, Wilf Lunn and Patsy Rowlands, Mooncat continues to learn about the ways of the world by looking into telling the truth, the pain of missing friends and trips to the opticians. The final series of Mooncat & Co finds Stephen’s brother Berni (Berni Clifton) taking over the shop whilst Stephen is away buying stock. Get Up and Go! ran for 56 episodes over three series between 1981 – 1983 whilst Mooncat & Co managed two series and notched up 32 episodes between 1984 – 85. Both productions were written by Rick Vanes with Shirley Isherwood and Sally Wells penning the illustrated stories in Get Up and Go! and Mooncat & Co respectively. Produced by Yorkshire Television, the two shows aired in the lunchtime slot on ITV and repeats followed shortly after each series’ initial run. “Lesley Rogers / Lesley Smith (she used both names during the course of the series) was asked to take over as producer on a long-running series called Stepping Stones, and wanted to put her own stamp on it. Lesley had given me my first break as a writer, allowing me to write a test script for an educational series for deaf children that she was planning. She liked the script and I went on to write two series of the show, Insight, and so when she was given Stepping Stones, she asked me to write it and come up with some ideas. 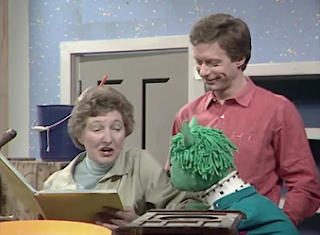 She wanted it to be entertaining, but full of good educational content for pre-school children, and fancied having a puppet in it. I came up with a cat from Outer Space, who wanted to find out about life on earth - thereby teaching the viewers at the same time - and named him Mooncat. It was a variation on the name that the early Beatles briefly gave themselves: Johnny & the Moondogs. 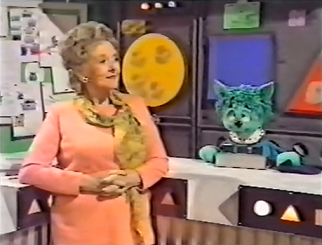 My other big idea was that instead of having a young presenter (most pre-school series at the time seemed to be fronted by bouncy young things, often wearing dungarees) we should have a grandma figure. I said my ideal would be Beryl Reid… and everybody laughed. Fat chance! 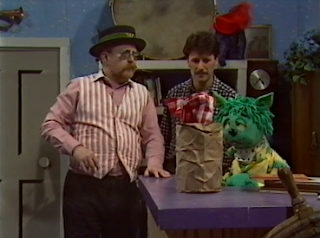 Integral to the development of Mooncat was the man behind the puppet, David Claridge, who would later go on to create Roland Rat. 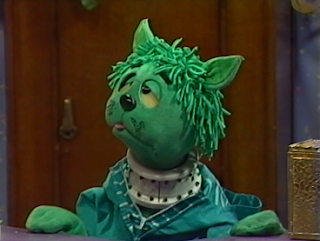 In fact, it was the rapid and burgeoning fame brought on by Roland Rat which would mean that David Claridge was unable to carry over to Mooncat & Co; in his place, puppeteer Christopher Leith stepped in to operate and voice Mooncat. “We spent a whole day in London auditioning puppeteers, without finding anyone who really impressed us. Last on our list was David Claridge, who was appearing on stage in a Mickey Dolenz production, operating a dog puppet, which he controlled with rods while wearing a blackout suit (and remaining in full view of the audience). Because of his theatre matinee commitments, he couldn’t make the auditions, so we had arranged to see him in his flat late in the day. “Tragically, Lesley Rogers/Smith died of cancer at a very young age while Get Up and Go! was still running, and an experienced director/producer - Len Lurcuck - took over. The first cast change was Beryl leaving to do Smiley's People for the BBC - a major drama, so who could blame her? Between us, Len Lurcuck and I felt she was a hard act to follow, and it wouldn’t really be right to cast an actress to replace her. As well as the cast and title changes, there were a number of other slight differences which affected the look and feel of the Mooncat universe as time went on. The original opening credits for Get Up and Go! featured children rampaging round at birthday parties, market stalls and libraries, but this was later replaced by the more familiar animated opening of Mooncat zooming down to Earth in a spacesuit. The first series also found John Sunderland illustrating Shirley Isherwood’s stories, but from the second series onwards, Maureen Roffey lent her artistic savvy to the proceedings. I was far too young to catch any of Get Up and Go! when it originally aired (I wasn’t even born until shortly after the second series) and if I did manage to sit in front of Mooncat & Co then these memories are lost to that pesky biological phenomena known as infantile amnesia. However, the more I heard about these two shows, the more I wanted to see them. After all, Rick Vanes has amassed a long list of writing credits and the fact that this includes The Riddlers is reason enough to tune in. 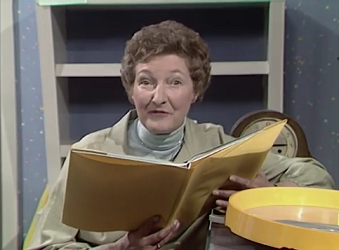 And, wait, it also features TV legend Beryl Reid? And an up and coming David Claridge? No longer was it a case of wanting to see them, I had to see them! Having never received a commercial release, and the last repeat airing over 30 years ago, tracking down footage of the two series was not simple. Thankfully, the BFI were able to come to my assistance and provided a selection of episodes from across the entire series for me to watch down at their viewing rooms. Excited by this prospect, I donned my genuine mid 80s Casio watch (I always do this when revisiting the decade’s TV) and headed down to London where the streets are truly paved with archive TV – well, a small side street just off Tottenham Court Road at the very least. Get Up and Go! immediately gets the young viewers on side by making use of a simple, familial setting which is immediately identifiable. Beryl is a dotty Grandmother type character, but one who is shot through with a thespian air and the wisdom this bestows on her underlines her eccentricity with a certain authority. At a slightly lower position on the age spectrum is Stephen who is like a cool, older brother who can not only play guitar, but also has an immensely likeable boy next door charm. 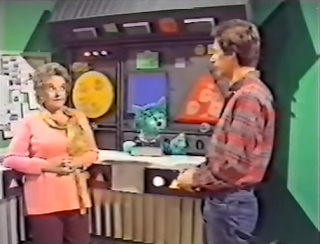 It’s through Beryl and Stephen, of course, that the framework of experience and learning is set down for the star of the show, Mooncat. A cute, astro-cat (he still retains part of his spacesuit as a collar) who is a curious shade of turquoise, Mooncat is clearly meant to reflect the child watching and demonstrates a thirst for knowledge about the world which perfectly reflects the outlook of the young audience. Prone to shouting out “Hooray!” Mooncat is an excitable feline and has a naïve outlook on the ways of Earth, hence his complete bafflement at concepts such as libraries and housework (to be fair, housework still confounds my natural impulses). She was also aware of her status, and insisted on there being a ‘keylight’ for her to hone in on in the studio. All I saw were banks of general lighting, but I was happy to concur. 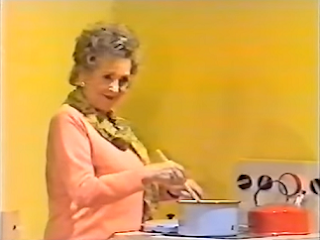 Saying that, there was one take when I came on and stood by her with a ‘Good morning Beryl’, to which she replied tartly ‘Morning Stephen’ whilst digging me sharply in the ribs with her elbow thus removing me from her self-styled spot. David Claridge and I became good friends and shared a house whilst shooting in Leeds. He had the most extraordinary creative imagination ranging from puppetry to pop music (he produced Monsoon’s ‘Ever So Lonely’ amongst others) to setting up a club (Skin Two in central London) and I remember him running the idea for Roland Rat past me (‘There’s this rat lives in the sewers under King’s Cross’), complete with drawings. And these hearty relationships are given a further welcome bedfellow in the guise of the Get Up and Go! format. The central element of the series is clearly education, but it’s one that celebrates a world which, despite being humdrum to the weary eyes of adults, is a never ending sense of awe and wonder to the young audience’s eyes. Take libraries, for example, which adults may view as studious, academic places to avoid, but for children – hamstrung by limited funds – it’s a magnificent portal to the worlds of fact and fiction where, get this, you can just take the books away. The guts of these episode themes are nicely dealt with by the filmed inserts, but this alone would be a meagre offering for anyone watching. Thankfully, Get Up and Go! eschews doing the bare minimum and makes sure that a whole package of fun is served up. That’s why we get to see Mooncat tackling these topics with a childlike glee as he writes a rhyming book with Beryl and Stephen, cleans dirty windows and does his absolute utmost to secure a pint of milk following the non-appearance of the milkman. Solidifying these themes further are the wonderful stories provided by Shirley Isherwood. Whimsical and filled with eccentric characters, these tales embrace simplicity to their very core and contain simple plots such as Mrs Pinkerton-Trunk’s lifelong desire to have a rose garden all of her own. Times change and Get Up and Go! becomes Mooncat & Co with the previously mentioned cast changes. And it’s still a splendid show. The loss of Beryl Reid and David Claridge is immense, of course, but their replacements take over faultlessly. Pat Coombes is the guest presenter in the very first episode and provides a tantalisingly glimpse at what could have been the perfect long term Beryl Reid replacement, but, like many of the guest presenters, it remained a one off appearance. Meanwhile, the noticeable change in voice is a little jarring at first, but Christopher Leith brings Mooncat to life to complete a mostly seamless transition. 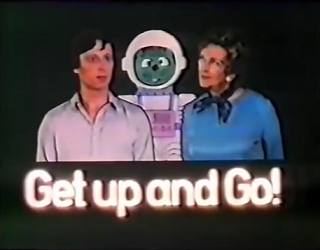 The format of Mooncat & Co is very much the same as Get Up and Go! 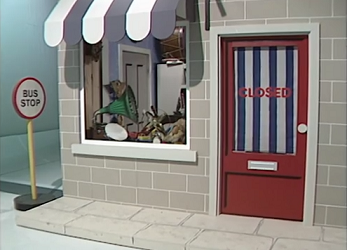 and the set itself appears to be the same one, but slightly redressed to allow for the shop front and Mooncat’s bedroom to become the focal points of the action. 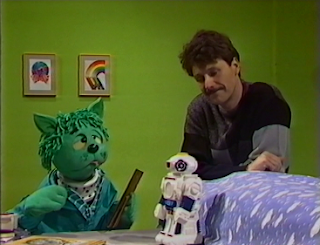 Mooncat also introduces Robert the Robot in the first episode ‘Shop’, a toy robot who chips in intermittently with observations. There’s a further change in the second series as Stephen Boxer departs and Berni Clifton comes in as his replacement, but Berni is a marvellous addition and there’s a fine chemistry between himself and Mooncat that helps retain the series’ soul. 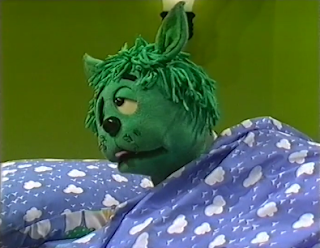 The first Berni Clifton episode ‘Missing You’ looks at Mooncat’s angst over Stephen’s absence and is surprisingly poignant for a pre-schooler show, but Mooncat soon perks up as he heads to the local train station to visit a photo booth and take a photo to send to Stephen. Other episodes find Mooncat designing a map for Berni to navigate his way to the post office, Wilf Lunn visits to buy a new hat which he proceeds to pull table legs out of before putting the hat back on and levitating (no, really!) 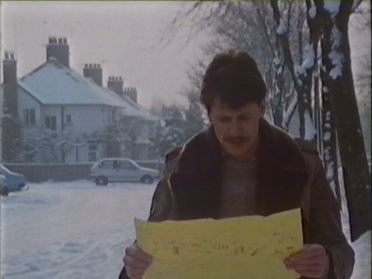 and the final episode sees Mooncat getting a pet rabbit, Ron. This series proved to be the Mooncat’s final hurrah with Rick Vanes feeling that the series had run its course and Mooncat’s exploration of our curious little planet came to an end. Get Up and Go! still holds endless memories for a whole generation of children born in the latter part of the 1970s, but more generalised looks at the genre seem to forget it and concentrate, instead, on much longer running shows of the era such as You and Me and Rainbow. However, there’s a reason that Mooncat managed to maintain a near constant presence on ITV for four years and that’s down to the wealth of talent involved. Every aspect is an incredible exploration of what children’s TV can achieve in terms of content, acting, production and the cumulative magic that this endows the series with. There’s so much to celebrate about the series – particularly in the shadow of all those cast changes – but most importantly, it’s the size of the smile it puts on your face. And it’s a worthy reminder as to why children’s TV remains in our hearts and minds all these years on.